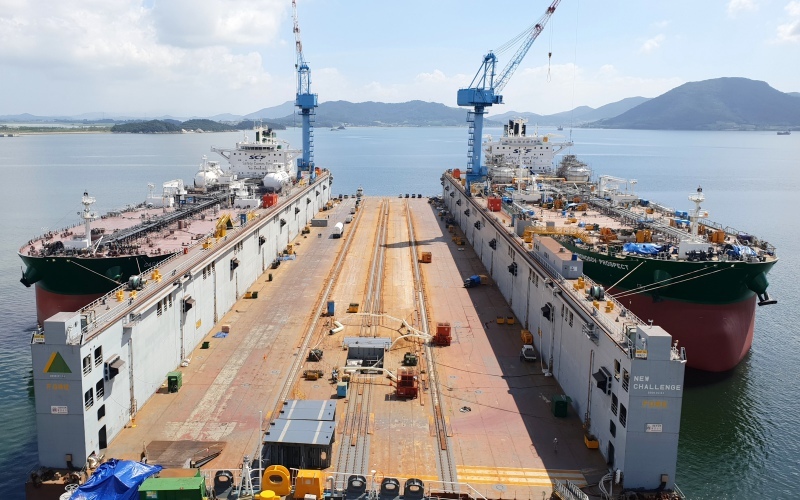 A scene from Hyundai Samho shipyard: large floating dock used for launching of vessels constructed on a skid, with tankers "Gagarin Prospect" (IMO No. 9826720) ready to be delivered and "Lomonosov Prospect" (IMO No. 9826732) fitting out. The large floating dock, named "New Challenge", built in 2008 is having some of its structure renewed. Hi Vlad, you got a strong argument here, so the floating dock is not a repair floating dock and is only used to launch shore built vessels and the cranes on her are for the fitting out of the ships alongside,but can it be used as a normal repair floating drydock? especially in an emergency (maybe in a conflict) also for naval vessels equipped with asdic domes etc. The position of the hole 1/4 from the bow makes it especially right for such work. This aperture could not have been designed and built from the onset, but is being converted in situ. In earlier years large liners were built with strengthened positions for guns for eventual and quick conversions to armed merchant cruisers, these alterations were funded by the governing authorities. Maybe some local member Korean or otherwise may shed more light on this "hole"
Thank you for such interesting photos and comments,always looking forward to look up your pictures .always great and interesting. But I don't think that this is the case hare, as the hole would need to be without any inside structure that might obstruct the dome (or azimuth thruster, for example). I would expect reinforced plating around the "hole", together with smaller, but thicker internal members, necessary to keep the strength. However, here the new tank top plating is shown together with internal floors and girders of "regular" size. Also, I have some other photos showing the actual welding of the tank top, welding that is permanent, and not some temporary arrangement in place to close the opening possibly needed in the dry docking process. After all, this is not a dock for "proper" dry docking of vessels, but rather an "unloading/launching" dock, used for launching of vessels built on horizontal land "skid" (the way it is known locally), hence the rails along the length of the dock, where dozens of electrically powered small cars are used to carry the ship from land onto the dock. David, I will try to find some other photo of the "New Challenge" dock. I suppose that the name of the floating dock is NEW CHALLENGE. If so, it would be nice to have another photo in "Special purpose vessels"
Well Vlad, in my view you are lucky, a third ship would have covered all of the interesting feature of the dock. I don't think that the dock is having any of its floor renewed, I think that this is an already constructed "hole" to fit the sonar underwater domes of warships, this aperture looks like it is being cleaned. A similar aperture is found in no.4 dock in Palumbo shipyard, similar apertures/holes may be found in the other 5 dry docks. I can only see the one in no.4 dock from way up on the bastion overlooking the dockyard when the dock is dry, so I can only vouch for the one in No.4 dock. Another great photo Vlad, keep them coming. Greetings from Okpo, South Korea! Very interesting picture my friend Vlad.Well done! Cheers,Volker.